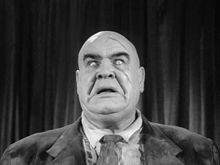 Tor Johnson (born Tor Johansson, 19 October 1903 – 12 May 1971) was a Swedish professional wrestler and movie and television actor. During his wrestling career, he was billed as the Super-Swedish Angel. Johnson was born in Sweden, the son of Karl J. Johansson and Lovisa Petersson. He began appearing in movies in 1934, usually as boxers or wrestlers. In the 1940s, he played lumbering thugs and scowling plug-uglies. He appeared with Bob Hope and Bing Crosby in Road to Rio (1947), in Abbott and Costello in the Foreign Legion (1950), and with Shirley Jones in the movie version of Carousel (1956). He is best known though for his appearances in the low budget movies directed by Ed Wood. He played Lobo in Bride of the Monster and Night of the Ghouls, and the zombified Inspector Clay in Plan 9 from Outer Space. In the early 1960s, he had guest appearances as wrestlers, thugs, and circus strongmen in various television series including Peter Gunn, Bonanza, and The Shirley Temple Show. Johnson died in San Fernando, California, from heart failure in 1971. He was buried at the Eternal Valley Memorial Park in Newhall, California. Place of death San Fernando, California, U.S. This page was last changed on 29 July 2014, at 18:24.